Frustration and fatigue were starting to simultaneously set in on me on 20 June 1965. We were 30 days into our third at-sea period, and the ops tempo was intense. Ten days prior we had our first loss, one of our nuggets, Carl Doughtie. The last four days we had not been especially successful. During those four days I had flown 21 hours on an Alfa strike, two road recces and a seven and one half hour RESCAP. The strike was marginally successful with 40 percent BDA, the RESCAP was not. We had to leave the downed pilot when it got dark. One road recce was nothing more than harassment. The other I scored one truck, but someone almost scored me while I was executing a life-saving pullout just short of bending the prop. I logged two nice round holes in the aft fuselage. The day began normally with the starboard catapult crashing into the water-brake outside my door acting as my alarm clock. It was supposed to be a stand-down day, but by noon we were suiting up for an emergency RESCAP. An Air Force photo-recon pilot had been shot down very deep into the northwest corner of North Vietnam. There were already RESCAP aircraft over the downed pilot, but they were running low on fuel. We were needed for backup coverage. We manned up, started and were told to shut down. Someone else had covered the pilot, and they did not need us. We unmanned and returned to the ready room and waited. Two hours later we got the call again. We manned up, but did not get started again before we were again put on hold. By the time we got to the ready room we were told to man up again. This time, however, we started, were told that we were a go mission and began our taxi forward to the catapults. At the last minute my Plane Captain, AN Halcomb, gave me a slush filled thermos and a hopeful look (hopeful that he would not have to do a fourth preflight on old 577). I gave him thumbs up and taxied forward to the starboard catapult. It was almost 1800. I spread and locked the wings, got thumbs up from the final checker and agreed with the flight deck officer on a 21,300 pound launch weight. As I felt the Skyraider settle into the catapult holdback, I release the brakes, added full power and scanned the engine instruments. Everything looked good and with the canopy open everything sounded good -- well at least loud. I returned the cat officer's salute and waited. I saw my flight leader go off the port cat and turn right for our standard starboard side rendezvous. The humidity was so high that his flap tips left contrails and my prop was making corkscrew contrails as the carrier moved through the sultry gulf air. The cat shot killed my radio. We rendezvoused 1,000 feet on the starboard side of MIDWAY and headed west. After reforming in a finger four formation I tried to get my radio working. As the second element leader I had a "Middleman" aircraft. My airplane had two radios with a relay control box that could be switched so that the low aircraft covering the downed pilot could transmit through my aircraft to the ship using my aircraft at a higher altitude as an antenna relay. I was able to get the number two radio working, but continued to fiddle with number one so that I could act as relay. I got it working and checked in on tactical frequency as we went feet dry. Then it failed again. Feet dry at 12,000 feet heading northwest we were passing north of Thanh Hoa. LCDR Ed Greathouse was in the lead. On his port wing was LTJG Jim LYNNE. I was on his starboard wing with Charlie Hartmann on my starboard. We all had the standard RESCAP load: two 150 gallon drop-tanks on the stub racks, four LAU-3 pods with 19 2.75 inch rockets apiece and 800 rounds of 20mm for the four wing cannons. We were flying steadily toward the downed pilot while I navigated, searched for active low frequency ADF stations (Until September 1965 the North Vietnamese MiGs used the ADFs listed in our 1964 navigation supplements) and considered what the situation ahead might be. Suddenly Ed Greathouse rolled inverted into a near vertical dive with Jim Lynne following. I rolled and followed him down. I was concerned that I had not heard anything and that we were only 70 miles inland, at least 80 miles from our RESCAP point. A quick radio check confirmed that my radio was dead. I had missed the buildup to the run-in with the USS STRAUSS (DE-408) alerting us to MiGs in the area. The MiG pilots were on an intercept for two Skyraiders south of us, but missed and were coming around for another intercept when they spotted us. STRAUSS was keeping Ed Greathouse updated, and when it was apparent that we were the target, Ed took us down. At 12,000 feet and 170 knots we looked like Tweetybird to Sylvester the Cat. Our only hope was to get down low and try to out turn the MiGs. Ed was doing just that. Our split-S got us some speed and reversed our course toward the ship. I figured that any time my nose was pointed at the ground my ordnance should be armed. I armed the guns and set up the rockets. About that time I saw a large unguided rocket go past downward. My first inclination was that it was a SAM, but SAMs generally go up. A second rocket hit the ground near Ed and Jim. There was no doubt we were under attack by MiGs. This was confirmed when a silver MiG-17 with red marking on wings and tail streaked by Charlie and me heading for Ed. Tracers from behind and a jet intake growing larger in my mirror were a signal to start pulling and turning. As I put g's on the Skyraider I could see the two distinct sizes of tracers falling away (The MiG-17 had two 23mm and one 37mm cannon in the nose.) He stayed with us throughout the turn firing all the way. Fortunately, he was unable to stay inside our turn and overshot. As he pulled up Charlie got a quick shot at him but caused no apparent damage. He climbed to a perch position and stayed there. Our turning had separated us from Ed and Jim. Now that we were no longer under attack my main concern was to rejoin the flight. I caught a glimpse of the leader and his wingman and headed for them. As we had been flying at treetop level in and out of small valleys, we had to fly around a small hill to get to them. Coming around the hill we saw Ed Greathouse and Jim LYNNE low with the MiG lined up behind them. I fired a short burst and missed, but got his attention. He turned hard into us to make a head-on pass. Charlie and I fired simultaneously as he passed so close that Charlie thought that I had hit his vertical stabilizer with the tip of my tail hook and Charlie flew through his wake. Both of us fired all four guns. Charlie's rounds appeared to go down the intake and into the wing root and mine along the top of the fuselage and through the canopy. He never returned our fire, rolled inverted and hit a small hill exploding and burning in a farm field. Charlie and I circled the wreckage while I switched back to number two radio. We briefly considered trying to cut off the other MiG, but were dissuaded by the voice of Ed Greathouse asking what we thought we were doing staying in the area when STRAUSS was reporting numerous bogeys inbound to our position. We took the hint and headed out low level to the Tonkin Gulf were we rejoined with our flight leader. By now the sun was setting guaranteeing a night arrested landing back at MIDWAY. Our radio report was misunderstood by MIDWAY CIC which believed that one of us had been shot down. It took some effort for Ed Greathouse to convince them that we were OK and the North Vietnamese were minus one. Rarely does a night carrier landing evoke as little response from a pilot as ours did. We were so pumped up that we hardly noticed it. After debriefs all around the politics started. Charlie and I were informed that we would get no recognition or awards for our MiG kill. SECNAV had been aboard three days earlier when VF-21 F-4 pilots had bagged the first kills of the war. Their awards were being held until SECNAV could get to Washington, announce it to the President and present it to Congress with the plea for more funds for F-4 Phantoms to fight the air war. Obviously, the success of primitive Skyraiders would undermine his plans. Unfortunately, someone had included our kill in the daily action report to MACV where it was read by COMSEVENFLT DET "C" who thought that it would be an excellent opportunity for Navy public relations. Indirectly Ngyuen Cao Ky, the new Premier of South Vietnam, and a Skyraider pilot, heard of it and recognized Ed Greathouse's name as one of the Skyraider instructors from the RAG. He then demanded our appearance for Vietnamese awards. The next day we flew to Saigon for the Five O'clock Follies and were instant celebrities, since the news media did not yet know about the F-4 kills. They assumed that we were the first which made an even better story. We stayed at the Majestic Hotel in Saigon where we thoroughly enjoyed the lack of water hours and the availability of our favorite beverages. The next day we were guests of Premier Ky at the palace were we were awarded Air Gallantry Medals and honorary commissions in the South Vietnamese Air Force. After the awards ceremony we sat down to tea with Premier Ky and some of his young hot pilots and traded war stories. He told us that the Skyraider MiG kill had boosted morale tremendously in the VNAF Skyraider squadrons. Upon arrival back at MIDWAY we were surprised to learn that there had been a change of heart and we would to be recognized at the same ceremony as the F-4 pilots. Since they had already been recommended for Silver Stars, Charlie and I go the same while Ed and Jim got Distinguished Flying Crosses. Due to slow processing of earlier awards Charlie and I wore the Silver Star and one foreign decoration for about a month as our only medals. Nothing like starting from the top. A few days later the carrier went to Yokosuka where Japanese reporters were very interested. We even became the subject of an article in a boy's adventure comic book. There was a lot of hometown interest also with reporters looking up our wives and parents for comments. This caused me a problem because I had not told my mother that I was flying combat to avoid worrying her. Needless to say, the VA-25 pilots were not about to let the slack-jawed beady-eyed jet pilots (Ed Greathouse's description) forget our success. The squawk box in the fighter ready rooms got plenty of incoming from our ready room. There was much frustration in the swept wing tail hook community as the next two kills went to the Air Force in July. Then the North Vietnamese pulled the MiGs for more pilot training. The only kill between July 1965 and April 1966 was a single Navy kill in October 1965. We maintained that we embarrassed them into pulling the MiGs. Our squadron, VA-25, "The Fist of the Fleet," was the last operational Skyraider attack squadron in the Navy. We were flying a 20-year-old design that had been perfected about as far as the engineers could take it. Everyone thought that our time was over as front-line attack. What everyone forgot was that Ed Heinemann had mandated that the Skyraider not only had to be able to carry that 2,000 pound bomb a thousand miles to Tokyo and return to the ship, but that it also had to be able to defend itself against air attack. We never forgot. Unfortunately, even Ed Heinemann could not foresee SAMs. The Skyraider just did not have the top end speed to evade them. In April 1968 VA-25 retired the Skyraider in favor of the A-7 Corsair II. The aircraft and pilot, Ted Hill, that made the last combat carrier landing led four A-7s in a flyby, broke off to the east and disappeared out of our sight, but not our hearts. Ted flew it to Pensacola where it resides in the National Museum of Naval Aviation in our squadron colors. I flew six combat missions in that aircraft. I flew as many hours in the A-4 Skyhawk as I did in the Skyraider and later flew the A-7. I truly enjoyed my A-4 time and it became my favorite. 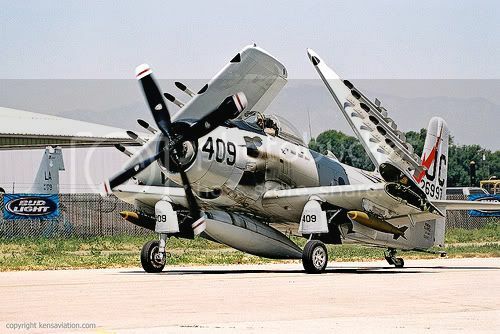 However, the Skyraider was something special. Even through my right leg has shrunken to the same size as my left leg, the carbon monoxide is cleared from my blood and the stack gas from my lungs, there is still that feeling that the Skyraider was where I was meant to be. One final note. The first flight of the Skyraider was on 18 March 1945, my eighth birthday. Editor: When news of the MiG shoot down arrived in VA-122, we fired off a message to our sister RAG squadrons at Miramar - offering "our assistance in improving their air-combat training." Another MiG shoot down by VA-176 on October 9, 1966 proved the ACM skill of SPAD pilots was not a fluke. Shortly, we heard that Miramar would be the home of the new TOP GUN School. What SPAD pilots had known all along really was important in combat. Interesting read. Like the Phantoms struggled with the older MiG-17, the MiG-17s struggled with the older Skyraiders? The first of the next generation isn't always better than the last of the previous one. The main point to consider is that the Skyraider was just a piston engine powered aircraft and the Mig17 was not only an advancement on the Mig15 but jet powered. There was a lot to read and I expected many to not get though it, but it was an interesting story from a guy that was there. Here is an account of a close call between an AH-1G and a MIG-21. Had the guy succeeded he would have eclipsed the A-1's achievement. He must have felt pretty strange when they put the Sidewinder on the Cobra a few years later. If he would have had them he'd probably have a MiG kill on his record now. Must have been pretty annoyed it took so long to get to it too.